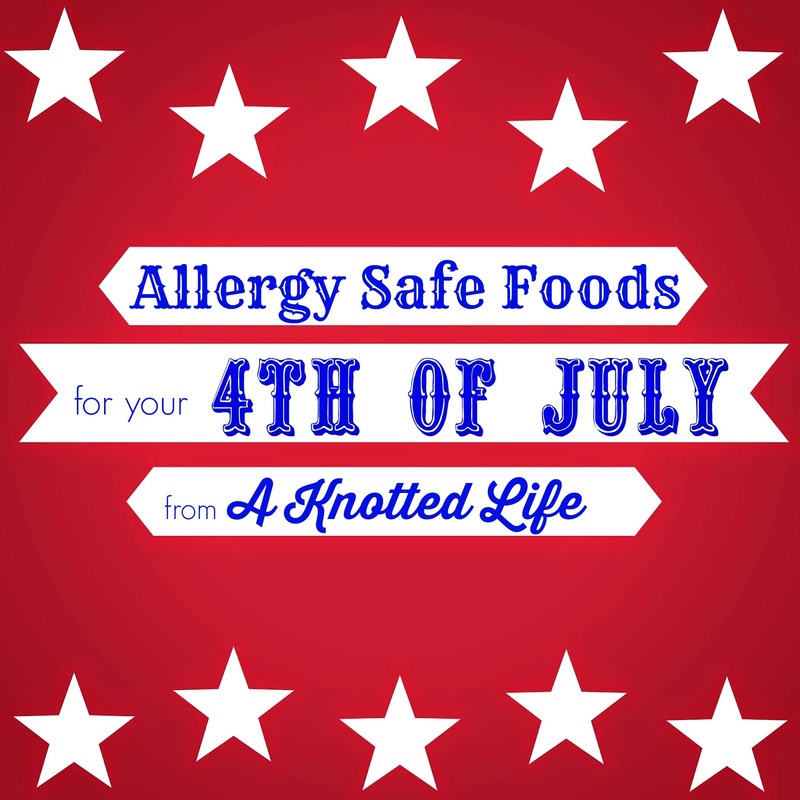 The 4th of July is celebrated with picnics, sparklers, BBQs, fireworks, and a nightmare of food if your child has allergies. As the mom of children with severe allergies to nuts, dairy, soy, wheat, tomatoes, and eggs I know how hard it can be to feed a child with allergies at a potluck or party. I also know it took me a couple of years to figure out what dishes I could bring that my kids would want to eat, could eat, and would fulfill my obligation to bring a dish to share. I don't believe it is the obligation of the other party-goers or even the host to make sure that everything is safe for my kids. My kids are growing up in a world where people eat the foods that can land them in the hospital, and they need to learn to ask what's in a food before they partake. They need to learn to be safe. However, I so very much appreciate when our friends and family prepare their dishes with my kids in mind. It is also just as important and meaningful to me when our hosts put in place preventative measures like having guests wash their hands and faces after eating and removing dangerous foods from the reach of little ones so grazing while playing doesn't happen. So either way: if you're hosting a 4th of July party and you're looking for some allergy-safe foods for your guests OR if you're the one with the allergies, here's some ideas of what we eat or bring to a cookout. Good ole ground beef is totally safe for my kids. People can make their own cheeseburgers as they fill their plates, so please keep the cheese off the grill and everyone is happy and safe. Oscar Meyer Turkey Selects are the hotdogs we prefer since they are nitrate and soy-free. Buns are a no-go for people with gluten issues, but there are buns without dairy or egg. Check the packaging and purchase those if possible. German Potato Salad has bacon so is naturally delicious. It also has no eggs or dairy and if a gluten free flour or corn starch is used can also be safe for those with wheat allergies. If a party needs potato salad, make the German kind! Corn on the Cob can be served with just some salt and pepper and perhaps some Earth Balance soy free buttery spread. Melted butter is probably one of my biggest fears since my son's dairy allergy is life-threatening, and even margarine has a dairy product in it. The Earth Balance soy free spread is the only thing I've found that both tastes good and is free of soy, dairy, and so on. Fruit Salad is an easy way to serve something that is naturally gluten, egg, dairy, tomato, soy, and nut free. Just leave the whip cream on the side for people to add or leave off as they please. Marshmallows are safe, though! Lettuce Salads are often prepared for cookouts and potlucks with all the toppings on them. It's nice to have a separate bowl that has most of the toppings on the lettuce, sans any nuts, cheese, or egg or dairy based dressings. Most croutons contain contain gluten, soy, and dairy and are often made in facilities with nuts so it's nice to have those separate, too. But veggies, fruit, bacon, and oil-based dressings are all safe! Tortilla Chips & Salsa or Hummus are also gluten, egg, nut, soy, and dairy free. And they're so good. One of my kids is allergic to tomato and doesn't like hummus but I always appreciate the option which is free. Plain potato chips are another safe buy. Salt, oil, and potatoes = crunchy, finger-licking, and tasty. Be careful, though! Most vegetable oils that are used on many brands of potato chips contain soy. Lays and Kitchen Cooked are two that use canola oil and are safe for people with soy allergies, though. Rice Krispies made with coconut oil or the Earth Balance soy-free buttery spread instead of butter are gluten, dairy, nut, soy, and egg free. And they're delicious! Apple Pie made with an oil crust and pats of coconut oil instead of butter are dairy, soy, egg, and nut free. I've tried making gluten free pie crusts and was completely unsuccessful, but if you have one please share! Wacky Cake is a super yummy chocolate cake without dairy, eggs, soy, or nuts. You can top it with a dairy-free icing if you want. We usually just sprinkle powdered sugar on top. Popsicles are usually gluten, milk, soy, nut, and egg safe and are a perfect treat for a hot day. Be sure to check the packaging first! I'd love to hear any other ideas! You can link to your own posts or leave your allergy-friendly food ideas in the comment box! Thank you! This is great to know! I have a niece and a nephew who are gluten-free (both have Autism and gluten aggravates) and yesterday, I made gluten-free brownies for them while the rest of us had Vincent's birthday cake and ice cream. My 11-year-old niece was so cute, she said, "You considered me. Thank you for considering me." It was so cute. I was happy to do so and it wasn't a huge deal. I keep a box of gluten free dessert mixes "just in case" they are over anyway, but it was so cute of her to say it that way. I love the fruit salad idea -- we do that one a lot!! And we love the Hebrew Nation hot dogs too...mostly because we just prefer the taste, but it's an added benefit that they are safe for our family members who need all natural things to eat. That story from your niece is so sweet! But it really does feel like that and it's so kind of you to consider them. I like to make Kabobs with chicken & veggies. Baste with olive oil / fresh herbs. Great List, most people don't realize all the foods that contain gluten, dairy or eggs. Kabobs - that's a great idea! Yum, German potato salad - no one makes it like that down here in the South (guess because there are so few German descendants down here). The site Chowstalker has only paleo recipes, so many of them are naturally gluten and dairy free. It's the first site I go to when looking for alternative recipes. How did you make those rice krispie treats - just added food coloring? German potato salad is actually my favorite and I think that even with the bacon it might be better for you than all that mayo. I think I made a double batch of rice krispies so there'd be plenty OR I put them in a 9x9 instead of a 9x13, but yes, I just added food coloring to the marshmallows. great list! We also have gluten and dairy issues to consider. I love keeping a pinterest board of safe eating ideas for my littles:) Have a wonderful holiday! Gluten free buns? They are a little expensive, but every once in a while I like to eat a burger that feels like a burger. Check out earth balance butter, it just has soy in it and is great for cooking... only down side is it is a little expensive, but what allergy friendly food is not.